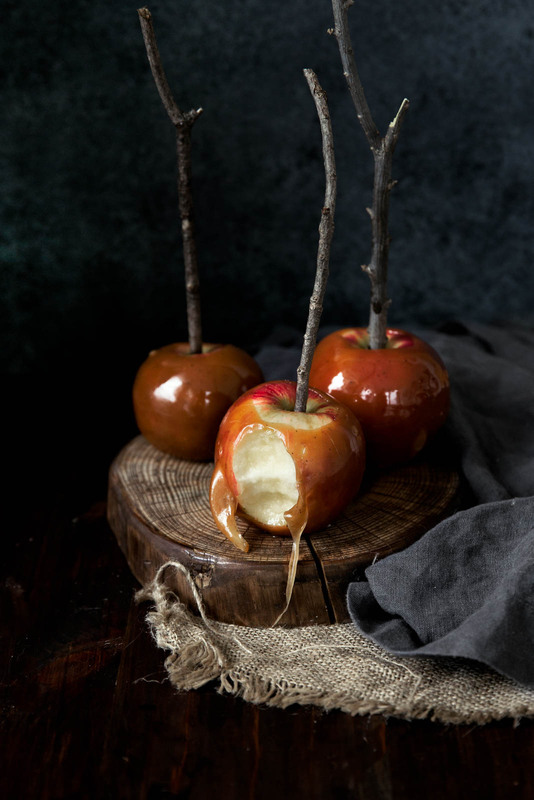 Homemade caramel apples spiked with bourbon and flavored with brown butter… uhm, YES PLEASE?! Caramel apples are a total weakness of mine. I used to want to go apple picking when I was little just so we could make caramel apples the next day. I remember my mom and I making homemade caramel apples together in the kitchen. We’d peel those individual chewy caramels from the store out of their plastic wrapping and melt them on the stovetop. I couldn’t wait for the caramel to cool I was so excited. But while the caramel apples from my childhood were made using store-bought caramel candies, now that I’m older, one of my favorite things is making homemade caramel. And though I’ve made caramel about 50 times, it still feels like magic every time I watch the golden sugar bubble with cream into this beautiful, silky caramel. And it’s so easy. Of course, because this is Broma Bakery, I had to do something special with these babies. So I made a brown butter bourbon caramel. Let me say that again: a BROWN BUTTER BOURBON CARAMEL. 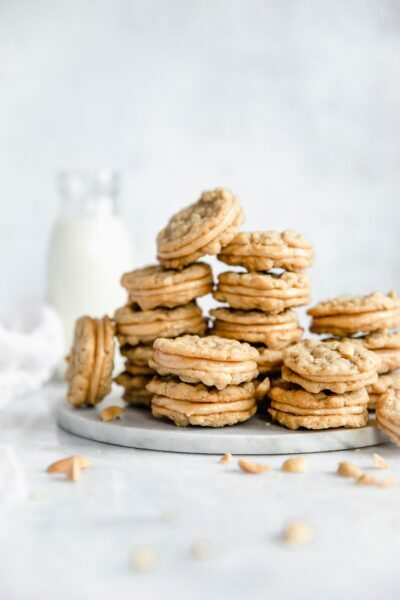 The brown butter was made using Challenge Dairy‘s fantastic butter. 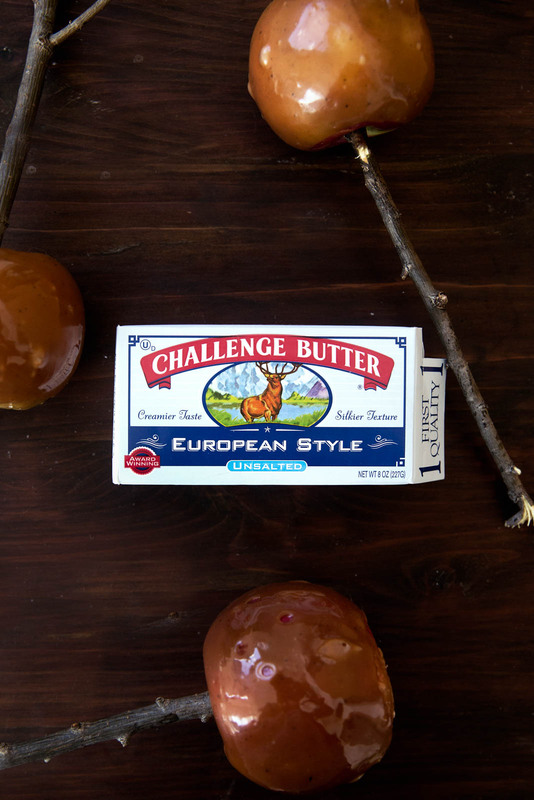 Challenge is a California-based butter company that has been around for over 100 years. 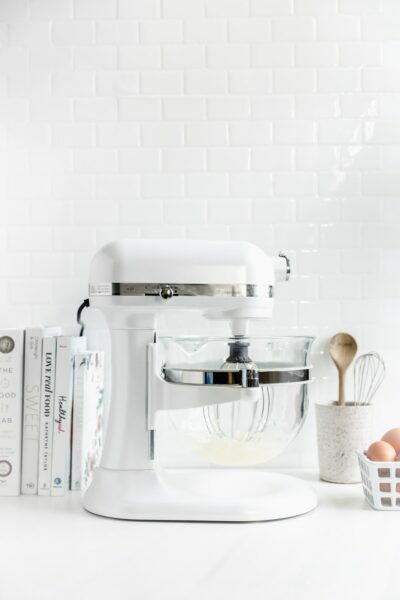 Though they’re the largest selling butter company in the west, they just recently started selling their butters and cream cheeses in Michigan, so I’m super excited to say that we’re partnering together for a series of posts this fall! Challenge gave me roughly 30 pounds of butter thus far, and I kid you not when I say I’m almost out of it. I’ve baked it into cookies, cakes, toffee, browines… you name it. And it’s baked up beautifully each time. So I am happy to say with 30 pounds of certainty that this butter is good stuff. Challenge and I have a number of posts coming your way, so be on the lookout for more fun things in the near future. And until then, keep an eye out for them at a store near you. Thoroughly clean and dry each apple. 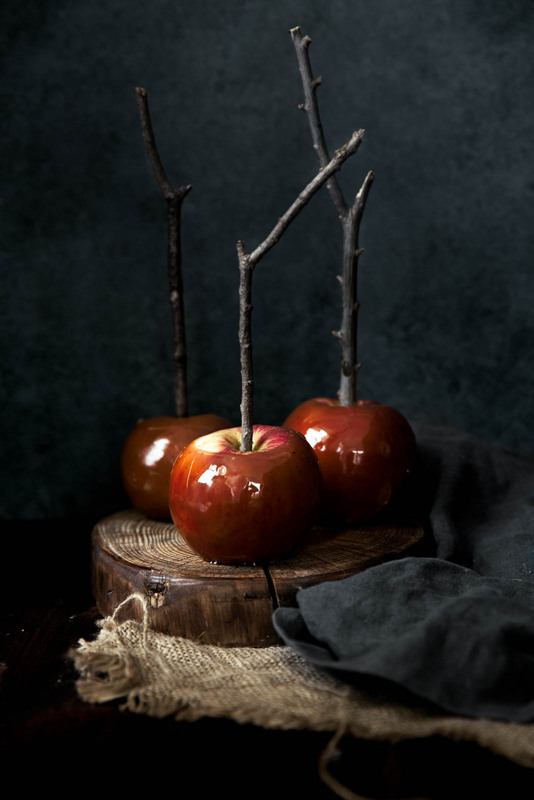 Remove stems and place twigs or sticks into tops of apples. Set aside on a parchment-lined baking sheet. In a small saucepan, heat butter over medium-low heat, swirling occasionally. Use a spatula to scrape butter from the bottom and sides so it heats evenly. Cook until small brown specks appear and butter smells nutty. Remove from heat and allow to cool while you heat the sugar. Place sugar and corn syrup into a medium pot fitted with a candy thermometer over medium-low heat. Use a wooden spoon to stir the sugar and corn syrup together. Once the sugar dissolves and begins to boil, stop stirring with the spoon. 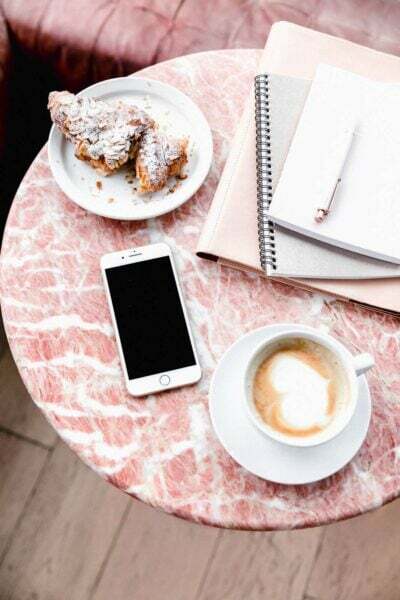 Resist the urge to stir from now on– doing so may cause your sugar to crystallize. You should, however, swirl the pot every minute or so. Heat sugar mixture until it reaches 300°F. The sugar should be a light/medium brown color- any darker and it will taste burned! Immediately remove from heat. Stir in brown butter, then stir in heavy cream, bourbon, and salt, stirring constantly while your mixture bubbles away. Place mixture back on medium-low heat and heat until it reaches 240°F. Immediately remove from heat. 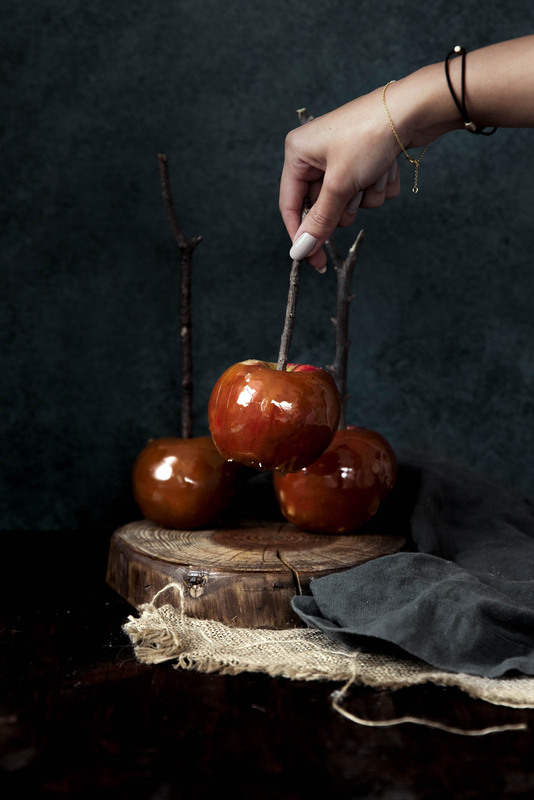 One by one, dip apples into the caramel, twirling around to coat evenly. Lightly shake apple over caramel so excess drips off. Place onto parchment-lined baking sheet. Repeat. Should your apples begin to get bubbles on them, place caramel back onto the stove over a low heat. Apples best served day of! This post was sponsored by Challenge Dairy. Thank you for supporting the companies that help make Broma possible! That caramel in that first pic tho…GUH. Gorg as always, girl! Yessssss! Apple season! These look awesome! Love love love!! Caramel apples are one of THE BEST parts of fall! And with the brown butter…..yum! I wonder why you use such light fonts that are barely readable and when printed are just about unreadable? If there’s anything that can get me excited for fall, it’s these beauties. Browned butter is one of my favorite ingredients to bake with. I usually like to use it when making cookies or frosting, but I love the idea of adding it to caramel apples! Thanks for sharing!